BitF gets controversial! Actually, perhaps not as much as it may initially seem; this comic isn’t really about Brawl/Melee or even gaming in general. I grew up on the NES, and loved nearly every game I played on it! Going back to several of them nowadays, a lot of the issues with these games can come to the forefront, and this can also apply to stuff like TV and movies as well. But you know, as I get older and crustier, sometimes I do wonder whether a discriminating taste is always ideal for enjoying the simpler things in life, like video games. At this point, I find myself dissecting games in the manner of critiquing a work of art, which can be enlightening for those that want to enter this industry. At the same time, though, I think there’s a merit to the “casual” gamer type out there as well, the ones who get a thrill simply out of seeing their Mii swing at a ball, enjoying the charm of a virtual DS puppy, or watching Mario toss a fireball at Sonic. So who do you agree with–the educated yet cynical Dedede, or the blissfully ignorant Kirby? Side note–this is the first (and probably only) “two gamers on a couch” type comic in BitF’s archive. I guess every video game comic gets the urge to do something like this at some point! For anyone curious on my actual opinion of Brawl, of course I love both it and Melee. I’d probably rank Melee a little higher due to the sheer magnitude of all the STUFF it added, but I’m not a tourney type and for casual play, Brawl, due to its impressive roster, stage set and music makes its way into my bashes all the time. I think more and more, I’m finding myself less interested in mastering the art of the Smash, and more interested in playing around with a wide variety of characters. That’s why Brawl is the most played SSB game in my home, and might point to me going full circle back into kid mode. P.S. The art’s gonna get a bit more experimental on Tuesday, mostly in the arrangement of the panels themselves. 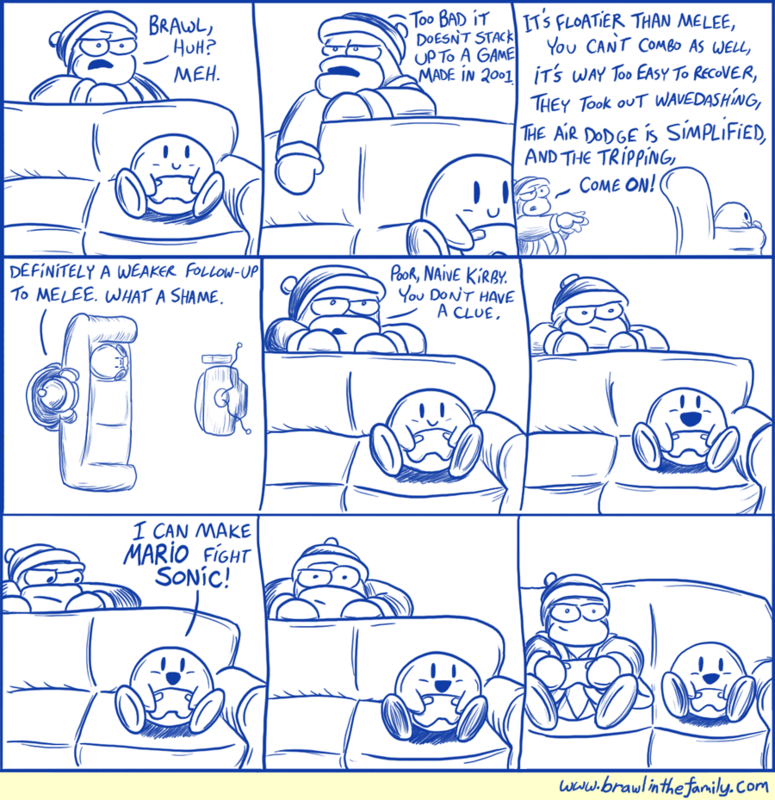 Brawl’s a great game, but if Matthew is Kirby in this comic, I’m Dedede.